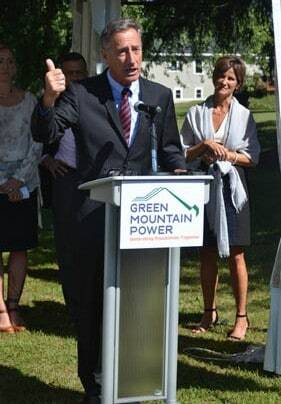 Congressman Peter Welch, Governor Peter Shumlin, Rutland Mayor Chris Louras, Green Mountain Power CEO Mary Powell, Raw Honey and Fruition Owner Rebecca Bounadonna, and homeowner Karen Correll spoke at a press conference Tuesday morning after Rutland was deemed the Solar Generation Capital of New England. White sunglasses were given out to participants at the press conference and at the Depot Park party Tuesday afternoon. The glasses says “Rutland Shines” on the side. 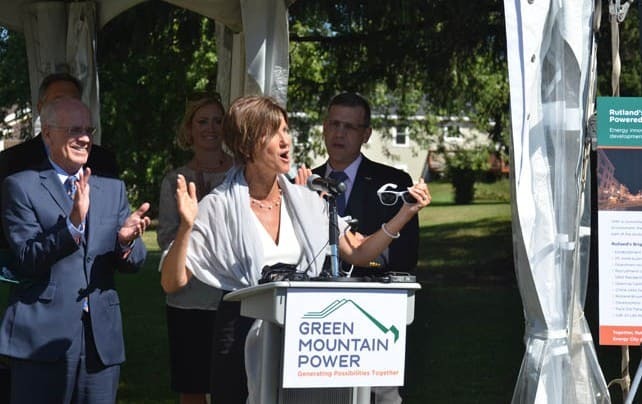 RUTLAND – Green Mountain Power CEO Mary Powell was joined Tuesday, Sept.15 by Congressman Peter Welch, Governor Peter Shumlin, Rutland Mayor Chris Louras, and community leaders to announce that Rutland, Vermont is the Solar Generation Capital of New England. More solar power is generated in Rutland per capita than any other New England city. This has been a goal years in the making as the community has come together to make energy innovation a key to economic development and Rutland’s revitalization. The facts are impressive. Rutland has 7.87 MW of solar installed currently, which is the most solar generation per capita of any city in New England. There are 51 homes, businesses and other projects currently generating clean energy in the city. Projects include Rutland Regional Ambulance, Farmers Food Center, The Paramount Theatre, Rutland County Parent-Child Center, College of St. Joseph, Rutland Regional Medical Center, and many more. 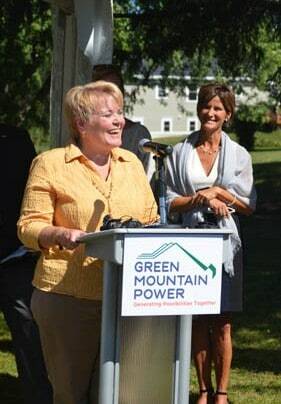 Green Mountain Power has worked with many stakeholders and energy leaders throughout Rutland and beyond to make this possible. Mayor Chris Louras is a key leader in Rutland’s revitalization and a key partner in the work to use energy innovation to transform Rutland, creating new economic opportunities for families and businesses. Stafford Hill is the largest project online in Rutland, generating 2.5 MW of energy. It is also a leading project in the nation, pairing solar generation with battery storage to increase reliability and power the emergency shelter at Rutland High School. Renewable energy credits from Stafford Hill and most larger generation facilities are sold, and all proceeds are used to reduce electricity rates for customers. Rutland has seen significant economic growth in recent years and as crime rates have declined, downtown occupancy rates have gone up to 96 percent and city initiatives like Rutland Blooms, Pack the Paramount and Gift-of-Life Marathon bring the community together. 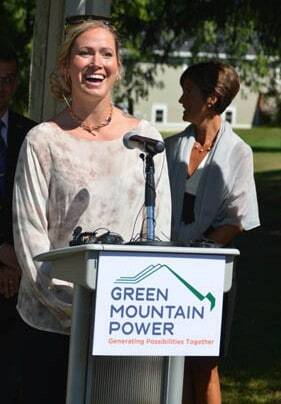 For its part, Green Mountain Power has invested in the downtown by locating its Energy Innovation Center on Merchants Row and has empowered residential and commercial customers to save money, use less energy and be more comfortable in all seasons with products and services like eHomes and eBiz, heat pumps and more. To celebrate the achievement, Green Mountain Power hosted a free block party Tuesday afternoon from 4:30 – 6:30 p.m. at Depot Park. The event featured music, free food by the Sandwich Shoppe of Rutland which is an eBiz, free Ben & Jerry’s ice cream, a drawing to win one of two Nest smart thermostats, and activities for kids such as face painting and games from the Wonderfeet Children’s Museum. Also there will be tables with information from: Efficiency Vermont, Neighborworks, Castleton University, College of St. Joseph, Stafford Tech, Same Sun, Grosolar, Suncommon, and the Rutland Regional Chamber of Commerce. To learn more about Rutland’s Solar Capital of New England designation or the energy-saving products and services offered by Green Mountain Power, visit www.greenmountainpower.com.